An imaging biomarker is used as a diagnostic mechanism which can be detected through an imaging technology. A biomarker is a biological molecule found in tissue, blood or other body fluids, which mark the presence of a normal or an abnormal process, or of a condition or disease. Thus, these biomarkers are used to monitor responses of the body to a disease. It can also be used for early detection of diseases such as cancer and therefore increasing the chances of survival of the patient. Globally, increasing number of hospitals and increased need for toxicity profiling are the prime growth drivers of imaging biomarkers. Growing number of cancer patients and need for early detection is estimated to be an opportunity for the market in the long term. However, high costs of these tests may be a hindrance for wide adoption. This report identifies the global Imaging Biomarker market size in for the year 2014-2016, and forecast of the same for year 2021. 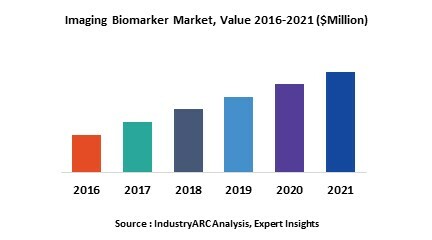 It also highlights the potential growth opportunities in the coming years, while also reviewing the market drivers, restraints, growth indicators, challenges, market dynamics, competitive landscape, and other key aspects with respect to global Imaging Biomarker market. Geographically North America dominates the global imaging biomarker market, and is projected to have fastest growth, owing to higher number of mobile, laptop, and tablet users. Emerging economies in the Asia Pacific region are expected to grow at the highest CAGR owing to rising awareness regarding the imaging biomarkers and continuous improvement in the healthcare infrastructure. 14.8. F. Hoffmann La Roche Ltd.